Does Kel love orange soda? He does, he does, he DOES! He also grew up, became a successful voice over actor, and has been nationally recognized for his charitable work. Kel Mitchell has been consistently in the business since his early days on “All That”, “Kenan and Kel”, and “Good Burger” (one of my most favorite movies of all time). I was fortunate enough to snag an exclusive interview with Kel for Best of Baltimore Blog AND for Sherryn Daniel’s blog! Kel Mitchell is the first actor from Nickelodean that i’ve ever interviewed and, luckily, my personal favorite! Sherryn: Can you tell us more about your voice-over work? Kel: I love cartoons and it is such a blessing to be doing Voice Over. I have been doing it for years you can catch my voice on tons of cartoons my first voice over gig was on Clifford the Big Red Dog I play T-bone the yellow bull dog on the show; it still airs on PBS today. Currently I am on Nicktoons “Wildgrinders” as JAY-JAY the show is created by pro skater Rob Dyrdek and I also star on Disney XD’s “Motorcity” as Dutch. Kel: LOL Why Not? It has become one of the #1 catch phrases of the 90’s. It cracks me up every time someone mentions it to me. It’s cool that so many people love that saying. Sherryn: What is the “Black College Expo? Can you tell us more about this endeavor of yours? Kel:It is an event that gives College scholarships to students on the spot. It is a full service outreach program to help connect students to College, Careers and Beyond. The mission is to stop the high-school drop out rate and increase degree and or certificate enrollment among underserved and underrepresented youth. They have great programs to help students succeed. Sherryn: What have you been up to recently? Voice over work? TV show appearances? 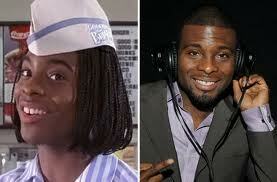 Kel: Well you already know about the voice over shows. I will be making a few TV show appearances this year Disney’s Liv and Maddie, MTV Retro, TV One’s Love That Girl, Nickelodeon’s The Thundermans, Adult Swim’s Loitersquad. Sherryn: Do you actually like orange soda? Kel: LOL. Yes I actually do but I drink the ones with zero calorie more healthy for you. Sherryn: Have you reconnected with anyone from your ‘All That’ and ‘Kenan and Kel’ days? Do you stay in touch with anyone? Kel: We had a reunion two years ago at the ComiKaze expo for All That it was good seeing everyone and we have stayed in touch via Twitter, Facebook and Instagram. Sherryn: What are your hobbies? Kel: Reading Christian books. You can always catch me at the Family Christian Stores they rock!! I also love eating popcorn while snuggling up on the couch with my beautiful Wife watching Netflix. We Love Netflix! Sherryn: How has your career in children’s television impacted the roles and career decisions you make today? Kel: It’s perfect for me because I enjoy doing roles and stories that have a positive message. Sherryn: Do fans still ask you to recite lines from ‘Good Burger’, ‘All That’, and ‘Kenan and Kel’? Kel: LOL all the time! Its so funny. I still do it for them. I think it is awesome that they enjoyed the show it is a blessing that the roles I played brought joy to a lot of people. Sherryn: How are you different/ and or similar to your role in “Kenan and Kel’? Kel: Kel Kimble was a good friend and a very supportive person. I guess we were similar in that way. I am not as clumsy as him but it was super fun doing that physical comedy he brought on the show. Sherryn: Tell us more about your past emmy nominations! Kel: Well my two Daytime Emmy nominations are from my role as T-Bone on the show Clifford the Big Red Dog. It was a honor to be nominated and I enjoyed working with the cast and the late John Ritter. He was such a talented comedic actor. I am a big fan of his work. Sherryn: You must get asked this alot, but do you keep in touch with Kenan? If not, what happened? Kel: Have not talked to him in awhile but I do support and watch his sketch work on SNL when I can. Sherryn: I read that you have helped reduce bullying in schools? Can you tell us more about it? Kel: Yes. I am also a writer and director. I had already been speaking to students at schools giving positive advice so me and my team decided to also show a film that I wrote and directed titled “She is not my Sister” the film shows students how having Faith and God can help stop bullying. It also shows them the power of forgiveness. I show the film and speak to students afterwards it’s a great time and has been a blessing. Sherryn: What bands you love to listen to? Favorite places to travel? Foods you love to eat? Kel: I love all kind of music. From EDM artist to to K-pop to 90’s R&B. To name a few currently I listen to Icona Pop, Gary Clark Jr, Nervo, V.Rose, B.A.P., Spica, Lecrae, Flame, Dre Murray, T-Haddy, Derek Minor, Spec, Eshon Burgandy, Travis Greene, Leon Thomas, Ariana Grande and many more I like music LOL. Places to travel…I love Jamaica and the UK. Foods Italian anything and “Veggie Grill” look it up you will love it. Sherryn: Any last words? How can fans (like me) reach you? Never give up and respond in Love to everything. Pingback: Do you remember the movie “Good Burger” from 1997? Read this exclusive interview with Kel Mitchel. | Simon Says... WATCH THIS!